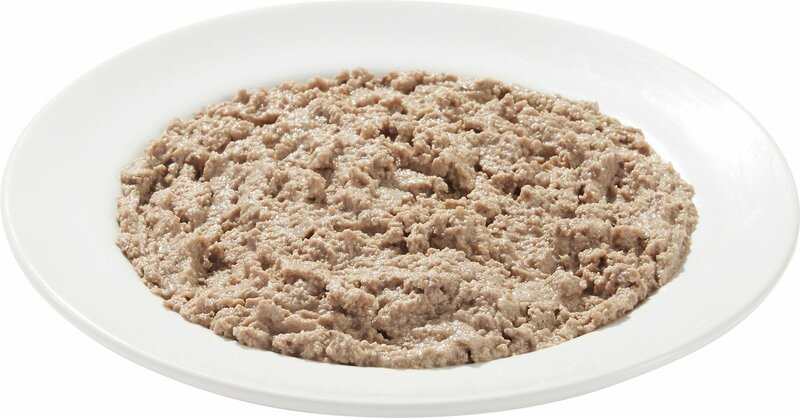 Give your cat a purr-worthy meal by serving up a can of Authority Beef Entrée Adult Pate. This lip-smacking recipe is rich in vitamins, minerals as well as other important nutrients. Taurine is an amino acid that helps support your cat’s overall health, while omega-3 and 6 fatty acids encourage healthy skin and a shiny, lustrous coat. Your feline friend won’t be able to resist the taste of high-quality ingredients like real beef, chicken, ocean fish and beef broth for added moisture. Plus, every bite is completely free of artificial colors, flavors and preservatives. So, give your cat some Authority and watch her lap up every last bite! High-quality protein sources like beef, chicken and ocean fish help maintain strong, lean muscles and encourage a healthy heart. Omega-3 and 6 fatty acids help nourish healthy skin and a shiny coat. Provides a great source of taurine to support the overall health of your cat companion. Contains zero artificial colors, flavors, or preservatives. Made in the USA with domestic and imported ingredients your cat won’t be able to resist. 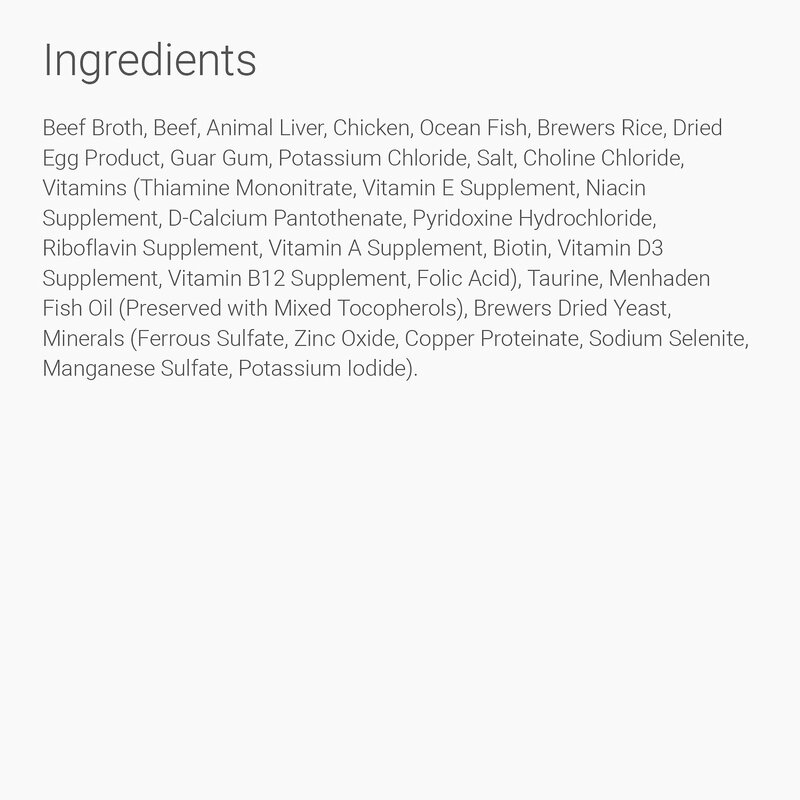 Beef Broth, Beef, Animal Liver, Chicken, Ocean Fish, Brewers Rice, Dried Egg Product, Guar Gum, Potassium Chloride, Salt, Choline Chloride, Vitamins (Thiamine Mononitrate, Vitamin E Supplement, Niacin Supplement, D-Calcium Pantothenate, Pyridoxine Hydrochloride, Riboflavin Supplement, Vitamin A Supplement, Biotin, Vitamin D3 Supplement, Vitamin B12 Supplement, Folic Acid), Taurine, Menhaden Fish Oil (Preserved With Mixed Tocopherols), Brewers Dried Yeast, Minerals (Ferrous Sulfate, Zinc Oxide, Copper Proteinate, Sodium Selenite, Manganese Sulfate, Potassium Iodide). For adults, feed 1 can for every 7 pounds of body weight daily. Feed according to the age, size, and activity of your cat. Feed at room temperature and refrigerate unused portion. Your cat should always have access to clean water. Authority is dedicated to ensuring every family has the nutritional food their pets need to thrive. 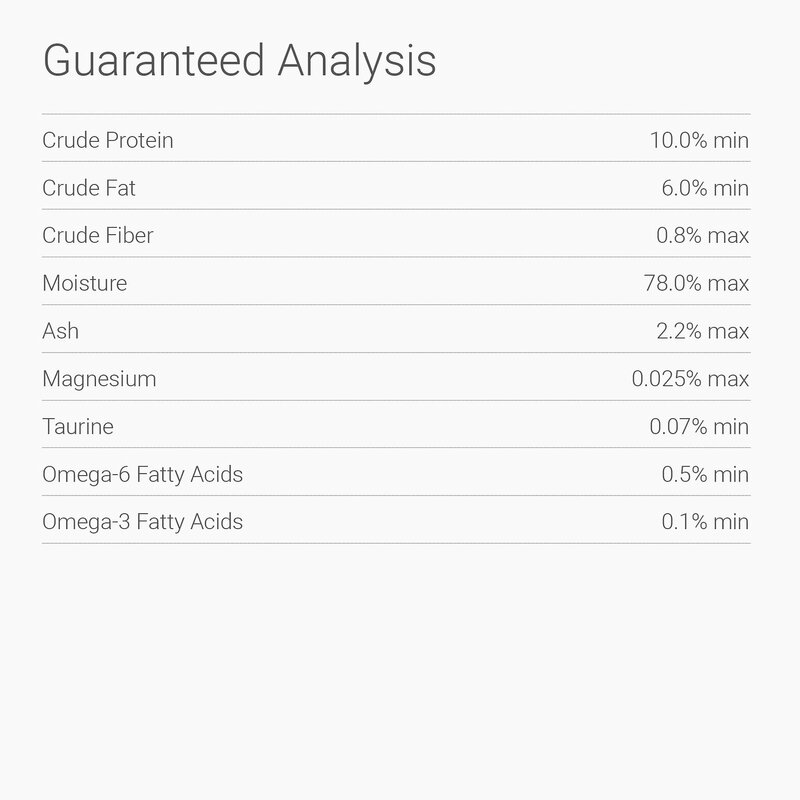 Each Authority recipe is formulated with delicious, high-quality ingredients like real proteins first, along with the essential vitamins and minerals your pet needs to feel the difference. From healthy skin and a lustrous coat to strong muscles, teeth and bones, every Authority recipe is designed with your cat's health and well-being as the number one priority. Authority offers a line of Targeted Health Solutions that are formulated to address your cat's specific needs. From recipes like Authority's Hairball Control and Hairball Control & Weight Management to Sensitive Support to help maintain healthy digestion, Authority has a food that will help keep your cat in tip-top shape. 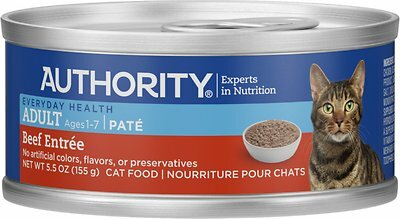 With Authority's special line of products dedicated to supporting common feline nutritional and dietary concerns, your cat's needs can get the nutritional attention they deserve. Pet parents give their cats Authority with confidence because they know that every recipe is made in the USA at a PetSmart-approved facility with first-class ingredients from around the world. Whether it's dry food, wet food or treats, each formula is packaged with care for your feline companion, and crafted with the taste your cat will love, and ingredients you can trust. Authority takes pet care even further with their very own Ora-Shield System—a scientifically formulated kibble that helps keep your pet's dental health in check. The crunchy texture works to reduce tartar and plaque buildup as your cat chews the kibble, so he can have a healthy smile and fresh breath while enjoying a tasty, nutritious meal. Your pal deserves a meal that provides him with the nutrition he needs to feel his best. That's why every Authority recipe is enriched with taurine—an essential amino acid that helps support overall feline health and well-being. Taurine also acts as an antioxidant to help support and maintain eye and heart health in cats. With Authority, you can feel good about giving your kitty a meal that has benefits in every bite. PetSmart has gathered a team of experts consisting of top veterinarians, pet nutritionists and researchers known as the Healthy Pet Advisory Council. These specialists are dedicated to helping PetSmart create advanced formulas that provide pets with the nutrition they need, as well as providing nutritional education and guidance so pet parents can make informed choices when it comes to the health of their pets. Description Address general dietary needs of cat by life stage. Formulated without corn, wheat or soy for healthy digestibility. A line of targeted nutritional solutions that help support unique dietary needs such as hairball control and weight management. Pure, Inexpensive and they like it! I have three boys (not picky, but they don't like everything). I was happy to find this, which is carrageen free and few ingredients, inexpensive and something I feel healthy enough to add into their mix of foods. They liked it too.